So... the madness of my life continues. With the move in high gear, I barely have anything left in my kitchen - but I managed to make a pasta salad and an appetizer for a family party this weekend. However, that is not what I am sharing with you today. I wanted to post this recipe for chocolate chip coconut cookies that I made while Lauren Vittles was here. I know, I know - my obsession with coconut is bordering on obscene at this point. But there is a method to my madness. Lauren's husband Tyler housed about 75% of the batch single-handedly, and 'hinted' (not-so-subtly) to her that he is hoping she'll make some. And by 'some,' I mean like... a truck load. ASAP. But I can't say I blame him - these are pretty awesome! In a large bowl, cream together the butter, brown sugar and white sugar until light and fluffy. Beat in the egg, then stir in the vanilla. Combine the flour, baking soda and salt; stir into the creamed mixture. Fold in chocolate chips and coconut. Drop by rounded spoonfuls onto cookie sheets. Bake for 8 to 10 minutes in the preheated oven. Allow cookies to cool on baking sheet for 5 minutes before removing to a wire rack to cool completely. Makes about 3 dozen. what a wonderful combo - you can never go wrong with chocolate and coconut! What a lovely combination. So good! I would love to try this. Do you think this well also work just using a microwave? I love coconut too and these look delicious! I'd eat a truckload of these too! What a perfect combo for the cookies. Yummy! 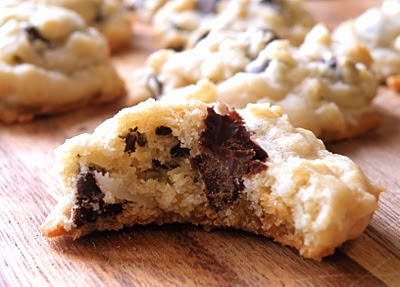 Oh my....I have never though to add coconut to my chocolate chip cookies....now I want it! :) Beautiful job. I rarely eat chocolate and coconut together, but these look lovely! Do you think replacing the butter with mashed banana would leave these cookies with a strange texture? This post is not helping my current cookie craving :) These look great! You really like coconut! :) Those cookies look so good. I like the addition of the coconut to a chocolate chip cookie. Great recipe! Congrats for being on top 9 ! I'm loving the combo of ingredients, especially the sweet coconut, will try it for sure ! WOOOOOT! Congrats on Top 9!!! I love this idea! Congrats on Top 9! Those cookies look so tender, delish!! MMMM!! Nicely done. I'm with you on a bit of a coconut obsession, and funny enough I didn't like coconut until a few years ago. Now I can't get enough! Congrats on the Top 9! If you haven't done so, please sign up as a follower on my blog so you won't miss out on the winner announcement and latest post. Thank you again and hope to see you again soon. Perfect combo! Thanks for sharing! Sounds like a crowd pleaser! I love chocolate covered macaroons so no doubt I'd love these. The recipe is easy-peasy too. these look great as I love the combo of chocolate and coconut..may have to give them a try!! 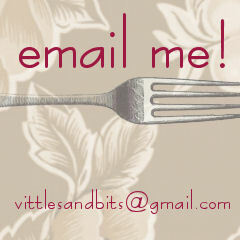 Saw you in a sidebar on foodbuzz --and really like this idea. Thanks! Hi Anonymous, I would say the most likely causes of flat cookies are either overmixing or using butter that's too soft. Would you recommend refrigerating the dough before baking? I heard it somehow improves the texture of the cookie when it bakes. @Sam Hi Sam! I'm sure it wouldn't hurt it if you prefer to refrigerate the dough. I have heard that it improves not only the texture but also the taste- richer & more caramel-like. But in order to get those benefits I believe you have to let the dough chill for at least 12 hours, up to 24. Also it may be harder to scoop. If you try it, let me know how it turns out! @Reese Herrick I'm not really sure... the original recipe didn't list the nutrition facts. If you're really curious though, you could probably add up the calories of all the ingredients and divide it by the # of cookies (36). Made these last night for my husband, and I got up this morning and he hid the cookies so I can't give them away for Christmas....Loved them. In the past 30 years, I have never made anything that compared to his mom's....he say's these are the best Chocolate Chip Cookies he has ever had. @Anonymous Haha wow that made me laugh! I'm so happy you found something that can compete with your mother-in-law's cookies :) Enjoy them!! Delicious. Made them. Only complaint is that they burn quickly on the bottom if not careful yet take a while to set in the oven. Still slightly, slightly wet and about 4 burned a bit. 11 of them were gone in seconds (4 of them went into my own belly!) Delicious just not sure if my oven is being tempermental. Remind me a bit of an oatmeal crisp - I like that. Do make this recipe - just watch it very carefully. Might be because I used margarine instead of butter. I was in search of a coconut chocolate chip recipe. Based on your comments and the other reviews, I am in for a treat! I've made these cookies twice and they taste wonderfully! My only complaint is that both of the times I have made them they bake flat, any idea what the issue is? The first time I followed the recipe and the second time I used whole wheat pastry flour and coconut oil instead of butter. What if I decreased the amount of baking soda? Yes you could try that, could also try chilling the dough first before baking. Also - what size eggs are you using? Hopefully large, not extra large, because too much egg can make cookies flat.